“Blakkst Skn” features Kaytranada and Rae Morris. The video—directed by London filmmaker Ian Pons Jewell, whose credits include clips for Vince Staples and NAO—is a perfectly surreal and darkly humorous fit for a track with simmering tension beneath its bouncy old-school beat. 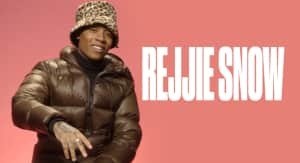 "I feel it’s actually that video I've always wanted to make," says Rejjie. "It's just so weird but still remains concise...you can make up all your own judgments.” Watch it above, and make sure you don't take your eyes off the screen: it only gets weirder as the actors in the video take his vision to the next level.